Comfortable, quiet, mountain townhome with fabulous rear deck views of Seven Spring Mountain Resort. New carpet and hardwood flooring, one car garage, fully equipped kitchen, washer/dryer, High speed Internet, central heat and A/C, 46' HDTV, bedroom TV, DVD, sound system for CDs and mobile music, nicely furnished. Inflatable Queen mattress sleeps two extra people. Loft above looking over the living room can accommodate sleeping bags or mattress. Very short walk to swimming pool, basketball court and beach volleyball. 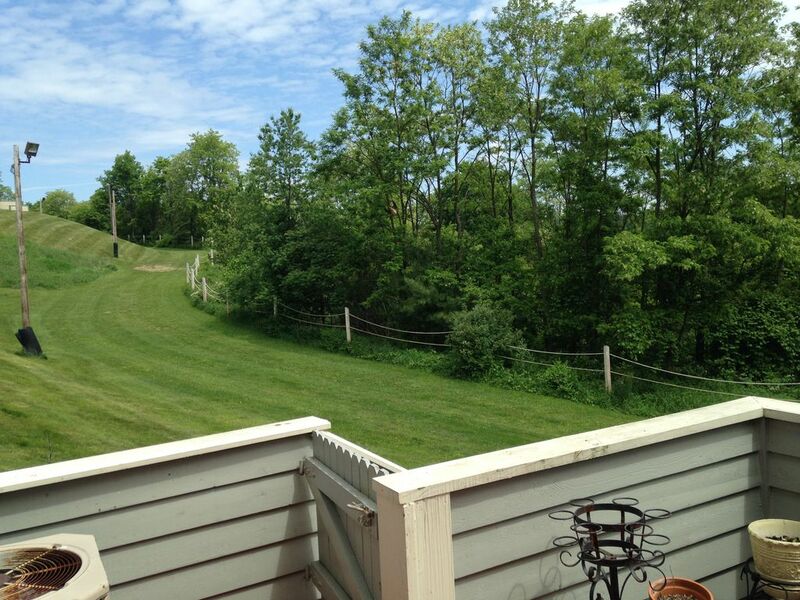 tennis, premier golf course, sporting clays, biking, hiking, skiing, snowmobile and ATV rentals all on the premises. Resort hotel 5 minutes away has three restaurants, pizza shop, indoor pool, arcade, bars, plus various retail stores. Jump on the shuttle bus in the morning and ski all the way to your deck when your ski day is through. Free shuttle transports guests to many ski lifts and the resort. Nearby Youghegheny River offers white water rafting and Frank Lloyd Wright's fabulous Falling Water. Paypal and credit card payments, please add 5% processing fee. Holiday weekends require a three night minimum. Website allows only one choice for minimum nights which is normally two nights. We had a wonderful time. The house was clean and equipped with all necessities that we need. The best part is ski-in. Enjoyable time and we’ll be back. Jeff was very friendly and easy to get in touch. We rent a lot of vacation properties esp in the 7 Springs area...I loved the layout and the deck was peaceful..I would like to compliment the owner he is great...his response time is amazing..after yrs of renting this is one of my top 5 and top 2 in the area..
We stayed 2-16-17 thru 2-20-17. Unfortunately Mother Nature decided to wreck havoc on our skiing plans with 60 degree weather in the middle of February, so our ski-in option didn't work too well since all of the snow on the ski in trail melted. The resort is good about shuttle service. On Fri at 6 pm thru the weekend the shuttle runs non stop. Stop 27 is right outside the front door to the left of this property, only steps away. Before Fri at 6pm simply call the resort and they'll pick you up at any time as requested. Condo is super comfy with a fully equipped kitchen, lots of pillows and bedding and plenty of TP and towels / linens. We did several loads of laundry and the washer/dryer worked great. Owner is very responsive and helpful. No internet - so make sure you have enough data on your phones. We were fine without wi-fi. Would happily stay here again. Lots of room. There were four of us - two adults and two kids. I definitely recommend staying here for a getaway! We were extremely happy with the property. We had enough room to be comfortable (with 8 people), though we did have to rearrange things a bit to accommodate air mattresses. The property was clean, the kitchen was well laid-out for cooking, and everything was well-maintained. Jeff was amazingly responsive and accommodating through the entire possible. We definitely look forward to going back some time in the future.